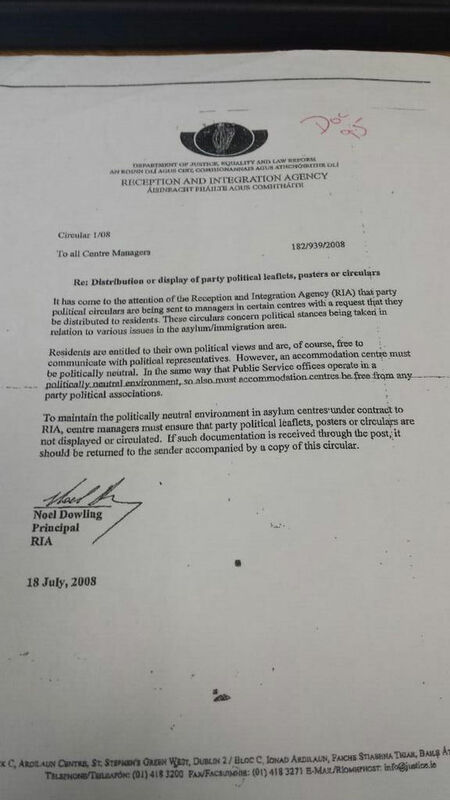 The following document was released some years ago to Dr Liam Thornton, a lecturer in law at the UCD School of Law, under a Freedom of Information request for any and all documents related to the legal regulation of Direct Provision. I have included a transcript of the document further below, for ease of reading. It has come to the attention of the Reception and Integration Agency (RIA) that party political circulars are being sent to managers in certain centres with a request that they be distributed to residents. These circulars concern political stances being taken in relation to various issues in the asylum/immigration area. Residents are entitled to their own political views and are, of course, free to communicate with political representatives. However, an accommodation centre must be politically neutral. In the same way that Public Service offices operate in a politically neutral environment, so also must accommodation centres be free from any party political associations. To maintain the politically neutral environment in asylum centres under contract to RIA, centre managers must ensure that party political leaflets, posters or circulars are not displayed or circulated. If such documentation is received through the post, it should be returned to the sender accompanied by a copy of this circular. A development has occurred in relation to the right to vote for residents in direct provision and access to information. As of yesterday, election candidates may (apparently) call into centres, and may leave election literature for voters to read. Dr Liam Thornton has a run-down at the Human Rights in Ireland blog. It seems it remains the case that election candidates may not call into direct provision centres, but residents can make appointments to see their candidates outside of the centres.